As the title suggests, its Duck l’Orange, but with fizzy orange juice. 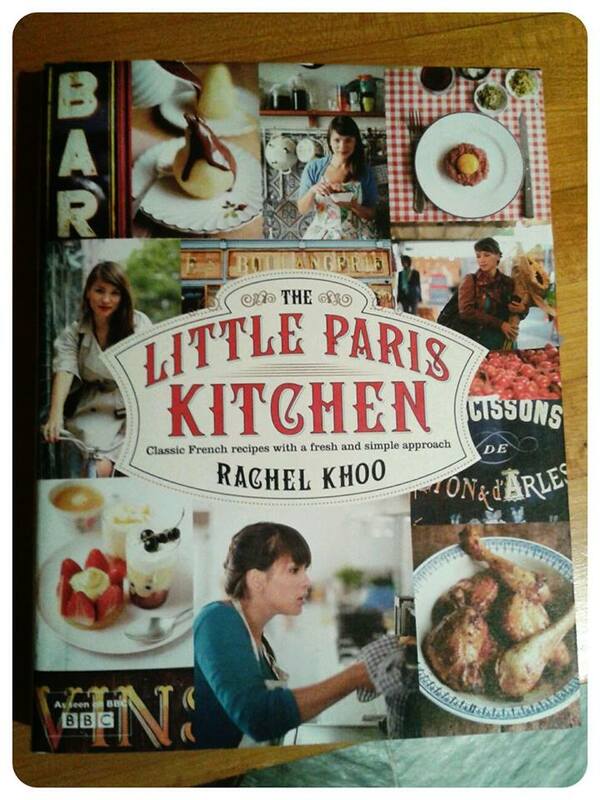 As the title should also suggest, this weeks meal came from Rachel Khoo again! Hurrah! This week is the first time I’ve ever roasted anything (I don’t think the chicken tikka counts as roasting) and the first time I’ve ever cooked duck. I had a bit of a dilemma when buying the duck. One of my New Recipe Night rules is that I’m not allowed to make substitutions unless I can possibly help it, but my lover doesn’t really like meat on the bone, or with skin on. So I thought about buying breast, which wouldn’t have been too big a change, but I realised I didn’t know how that would affect the cooking time. 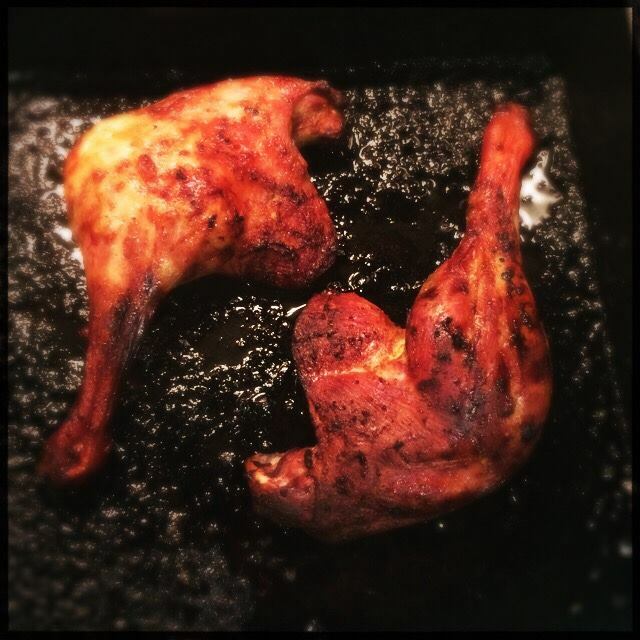 Also, my mother – the famous poisoner – keeps serving up duck legs and I wanted to prove to myself that I could cook them better than her… (One time I got a clip round the ear for remarking about how dry duck was for a bird that spends its life bobbing up and down on ponds). Unfortunately, nowhere seems to sell Orangina in the whole of West London, so I had to slum it with San Pellegrino instead, it’s very tasty but it doesn’t bring back memories of French holidays. If you can’t get hold of Orangina either then any fizzy (carbonated) orange juice would be a good substitute – but not fanta or tango or any other orange pop, because that’ll be disgusting. The bottle of Cointreau has moved house with me 4 times. 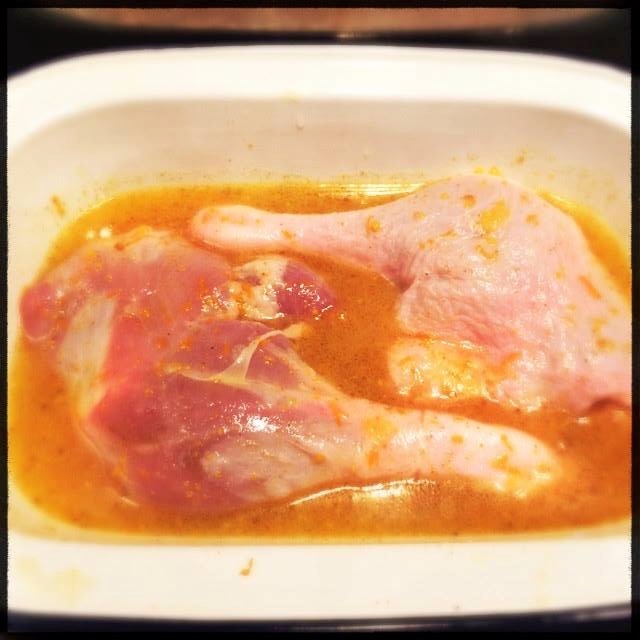 To make this for 4 you will need: 4 duck legs, 100ml fizzy orange, 2 table spoons Cointreau, salt, 1tsp red wine vinegar, 5 oranges (unwaxed) 1tbs olive oil, half tsp ground cumin, and salt. I made it just for me and him, so bought a pack of 2 duck legs from Sainsbury’s. I thought they’d be from the same duck, but instead got 2 left legs. I’m not in the country anymore. This takes a bit of marinading; a minimum of one hour, but over night in the fridge is better. Finely grate the zest of one orange, and then squeeze all of its juice into a bowl, add the zest, half a tsp cumin, 1 tbs of olive oil, and 1tsp of salt. Mix it all together then rub it onto your the duck legs. Leave to marinade. Cook the duck with the marinade in a roasting tray for 1 hour at 170c. After half an hour bast it with some of the pan juices. I didn’t have many pan juices, I think its because the tray was too big and my oven is slightly hot, so I topped up the sting with a bit of spare fizzy orange. As you can see I made a slight concession to my lover and wrestled the skin off his leg. I won’t do it again, it was a pain, and as you will see, the layer of fat and skin actually helped the duck cook without looking like a charred corpse. Fifteen minutes before serving add 100ml of fizzy orange and the Cointreau to a frying pan over a high heat and simmer until it has reduced by half, add the salt and vinegar. 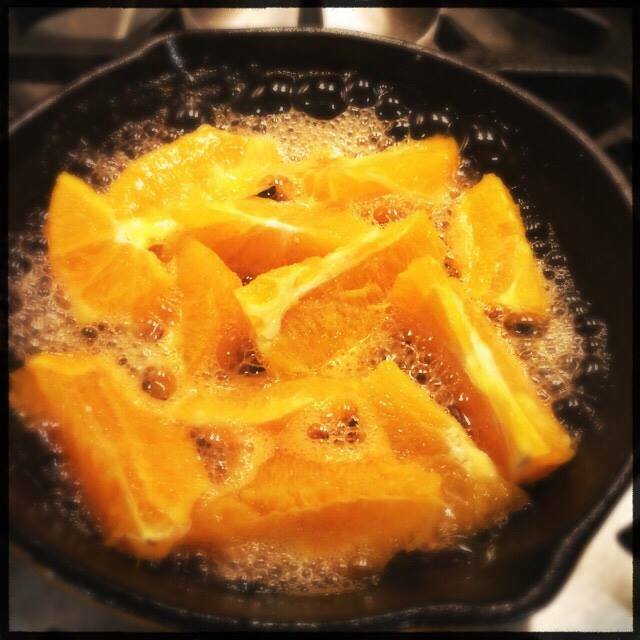 When the salt has dissolved add the orange segments and simmer for 5 minutes. 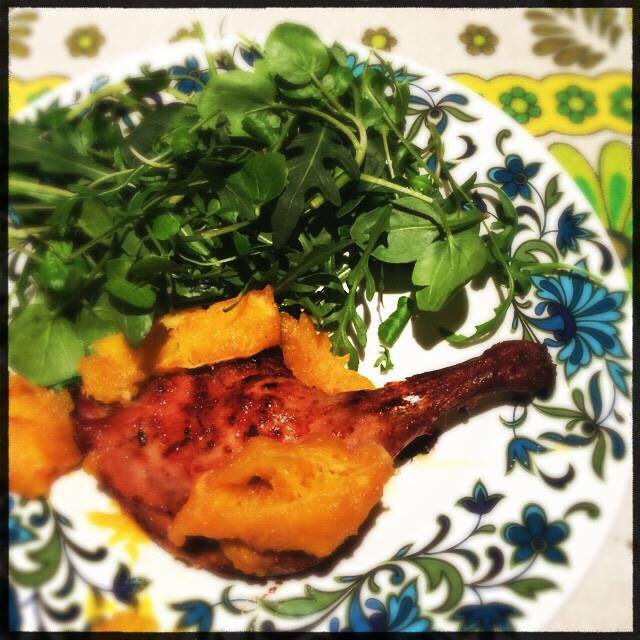 Serve hot, with the orange segments and a simple salad. I’m going to declare my first ever roast a success. Mine was lovely and moist, he said his was too, but it was putting up more of a fight than mine did. Next time I’m going to make it with breast, just because eating legs is a bit of a faff. 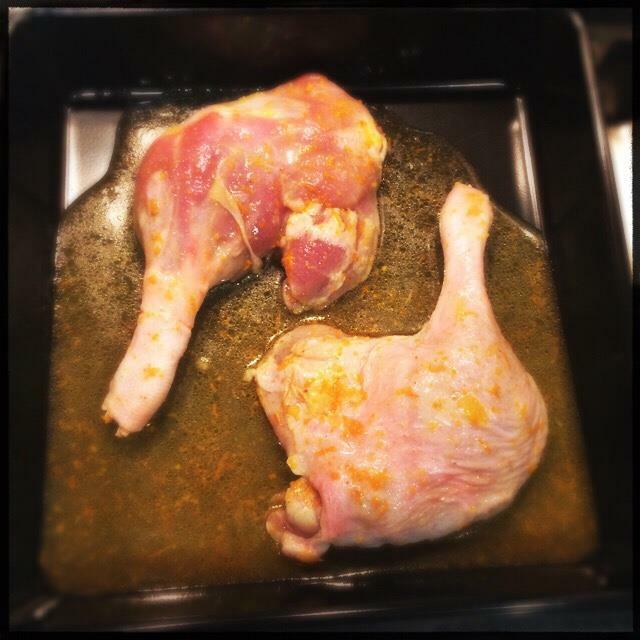 The marinade mostly stayed scorched on to the roasting tin, and is still there after a week of soaking and scrubbing. The sauce was tarte but not overpowering, and the duck was delicious. I’m glad I paired it with the salad; it didn’t need any other really strong flavours on the plate. 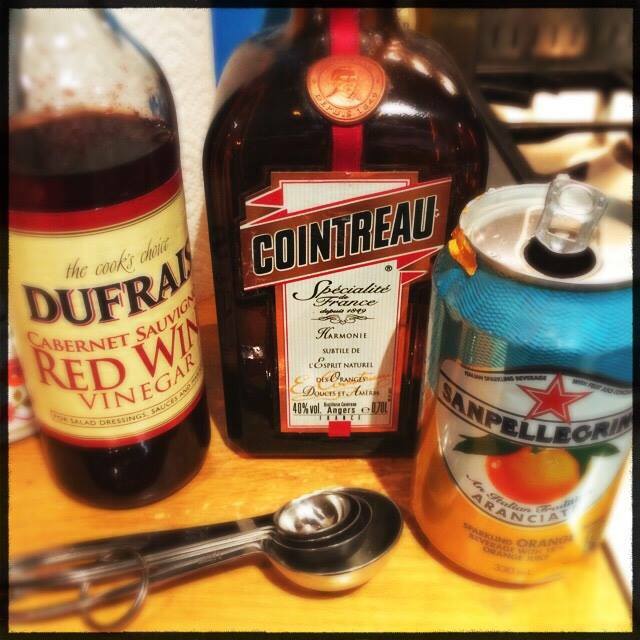 I’m definitely making this again, but with Orangina! Wow, this sounds wrong on so many levels but look like it worked out! Doesn’t it?!? I made it just to see if it would be wrong. It was so tasty, but I don’t know if that’s because it was so wrong it was right! Duck l’orange classic and delicious love the use of orangina here. It looks fabulous. Thanks for bringing to the party. Thanks for that and the funny bits! 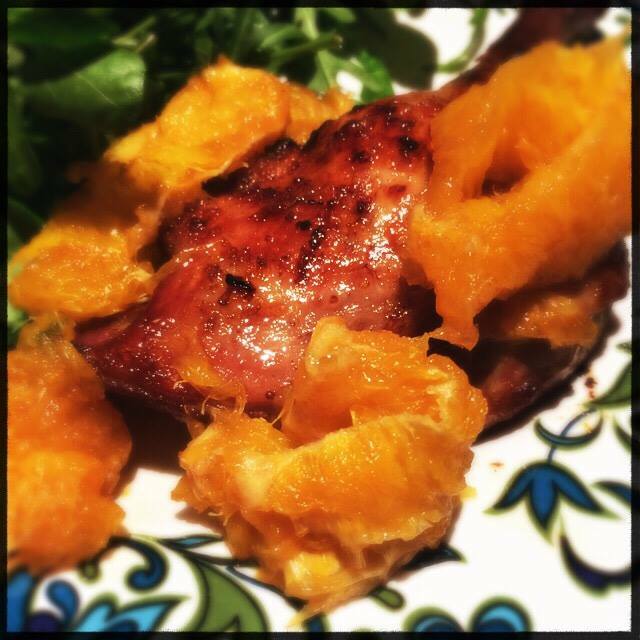 I’m now inspired to cook duck for the first time too and will try to find Orangina – which is indeed a lovely drink!